Fit my son perfectly -- only needed to have the pants hemmed. Great buy! 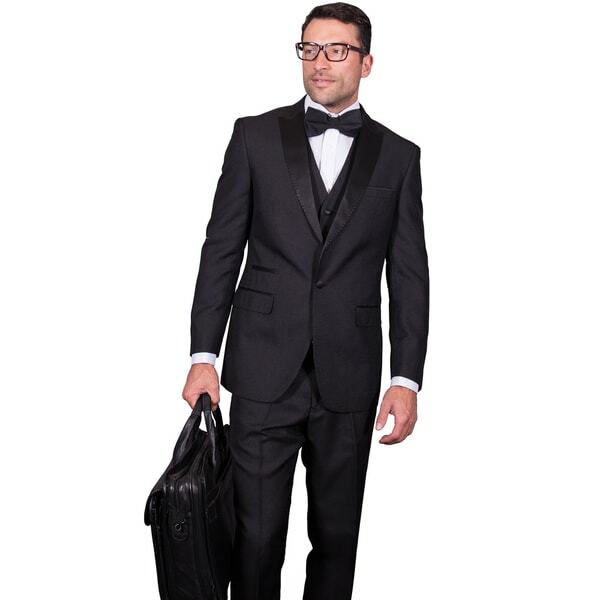 Polished and professional, this 3-piece statement suit tuxedois sure to turns heads. Made from high-quality wool, this suitshowcases a single breasted jacket with peak lapel, vest, and flatfront pants with a modern fit. A coordinating bow tie is alsoincluded. Gorgeous all wool Italian suit. I bought this for my son for prom. It was cheaper than renting and now we own it for future use. The cut is great and classic. "There is no option to select the pants waist size for this suit?" The pants and jacket comes together as one set. The pants is 6 inch drop up to size 46. 48 and up is 5 inch drop. So for example if you choose size 40R, pants is 34 waist (6 inch drop).